The formal vote was earlier today in Lima, Peru. Curious what our transit system will look like in 2028? Read this post. I wrote a few weeks about the World Series guaranteed to be beginning at Chavez Ravine on Oct. 24. But let’s back up a few steps. At this point, we can say for certain our freebie bus from Harbor Gateway and Union Station to the ballpasture will begin running for the wildcard game on Oct. 4 or the first game of the Division Series — against the Nationals, Cubs, Cardinals, Brewers, Diamondbacks or Rockies — on Oct. 6. They’ve been designed to emulate human driving behavior but with the human mistakes omitted. They don’t drink and drive, they don’t text while driving, and they don’t get tired. It has taken the collective effort of over two thousand people to create this product, and we believe that together we’ve managed to create something that will one day drive significantly better than any individual. Vogt does a good job explaining how complex these cars are. They have to be designed with many redundant systems because there is no driver to take over if things go awry. But can truly driver-less cars be mass produced, affordable and be made legal to use 24/7/365? Vogt, as expected, argues yes. He’s probably right, although I tend to think it will be later rather than sooner. And I’m not the only one that things rushing in the age of driver-less cars may not be the best thing. NHTSA’s updated guidance for driverless cars is a giveaway to the auto industry that will undoubtedly result in unnecessary lives lost. Photo by x@ray, via Flickr creative commons. The small mammal with big ears that lives near the top of mountains couldn’t be found in a 165-square-mile area between Tahoe City and Truckee in the northern Sierra. Researchers blame climate change, saying it has become too warm at high altitudes for pikas — adapted to cold weather — to survive. Climate change got you down? As we have mentioned in the past, generally speaking taking transit instead of driving alone is one way to reduce reduce greenhouse gas emissions. The headline doesn’t quite capture the gist-i-ness of the article, which is about falling bus ridership around the US of A. The response of more than a few agencies: redesign bus routes to better connect people with jobs via more frequent lines. As noted, it’s too soon to tell the impact on ridership although there are some signs of success — the Albany area has seen a 25 percent jump in boardings since 2009. Attentive Source readers know that Metro and other bus agencies in L.A. County are embarking on a similar effort. Metro’s goal — after extensive public hearings — is to start implementing some changes in 2019 and 2020. More about that here. Things that remind riders of nature are soothing, so says the article. Sounds right. Put a giant 30-foot panoramic photo of the Eastern Sierra at my train stop and I’m slightly more likely to be chill. 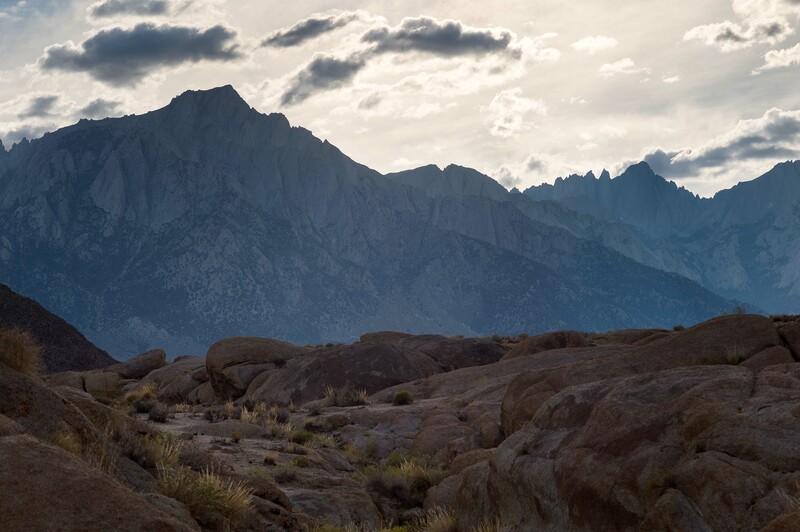 Gazing at Lone Pine Peak, left, and Mt. Whitney at my transit stop would be dope, so says me. Photo courtesy Steve Hymon. Things to listen to whilst transiting: awesome new song from U2. It’s a good time for new music with records burping out from War on Drugs, the National, Foo Fighters, St. Vincent, among others. I tweet and put stuff on Instagram. The present system is useless for this function. What is really needed is an integrated transit system I call the Southern California Regional Transportation Authority (SCRTA) similar to to original SCRTD but also including Ventura County. There could still be local bus systems run by each county, but the SCRTA would be responsible for all inter-county bus and rail service, including Metrolink. There should also be a universal transfer arrangement to facilitate seamless transfers between all rail and bus systems irrespective of operator. I and several others have suggested this in previous comments that have apparently been ignored. There is no hope for a better bus system until this asinine arrangement is obliterated. In New York, the New York MTA, which is a state agency, is responsible for all bus and subway transit in the five boroughs as well as for the Long Island and Metro North commuter rail systems. It should also be noted that the New York subways and commuter rail systems are experiencing record ridership, unlike what bus systems are experiencing, The state of New York helps fund major transit projects, We need a similar system in Southern California The California State Legislature should create an SCRTA here, including some funding as is provided for Amtrak. I see little hope for an overall improvement in local transit until something similar is provided here ASAP, certainly before the 2028 Olympics. The concept of biophilic architecture reminds me of some of the Red Line stations. The ones that come to mind are Hollywood/Vine with its fake palm trees, and Vermont/Beverly with the fake giant rock slabs. In my view, it’s not just a natural appearance, but rather being surrounded by artwork of some sort that’s soothing. A few of your elevated light rail stations have panoramic views of the hills (I’ve gotten some nice photos at Jefferson/La Cienega), but otherwise the stations’ drab LA surroundings can make them uninteresting. Steve, that’s Lone Pine Peak on the left. Pardon my nitpicking! Darn! I thought it was Langley. Good eye, Gary.